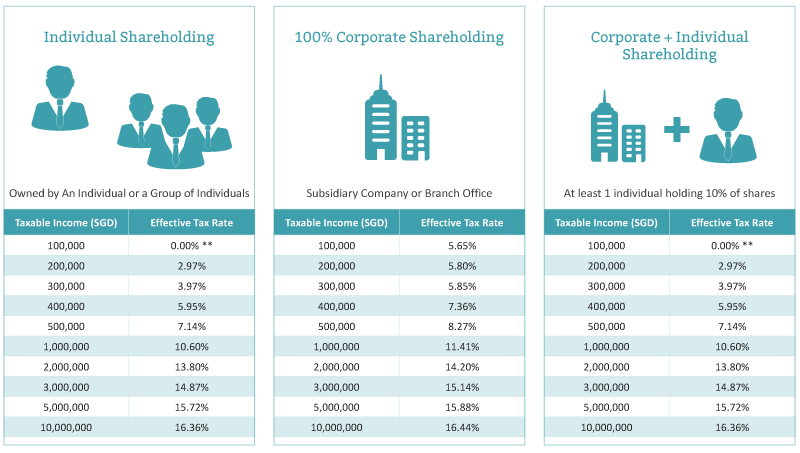 Singapore corporate income taxation guide, a detailed overview of corporate income tax requirements in Singapore. The corporate income tax rates in Singapore are among the lowest in the world. Singapore has a maximum corporate income tax rate of 17%. However, the effective corporate tax rate is much lower. Interested in our Accounting & Taxation Services? Contact us now. Investment holding companies and companies engaged in property development activities that are incorporated after 25 February 2013 enjoy only the partial tax exemption and Corporate Income Tax (CIT) Rebate at 30% capped at $30,000 for each YA. The GST (Goods and Services Tax) is a consumption tax that is similar to VAT. importation of goods into Singapore (collected by Singapore Customs). All businesses with a taxable revenue exceeding S$1 million per year must compulsorily register for GST.